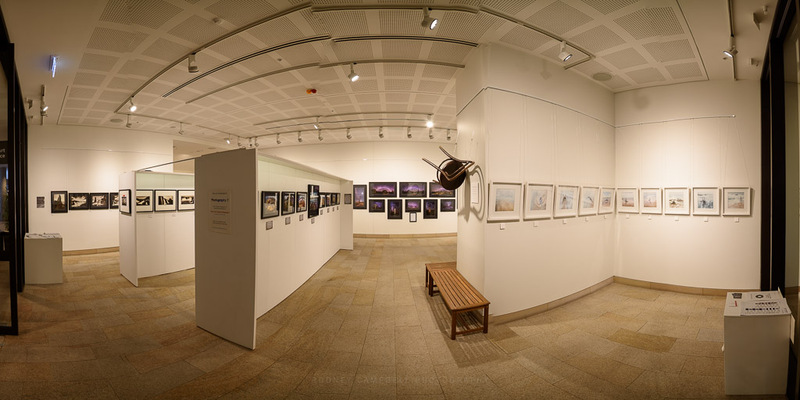 Here are some interactive 360˚ panoramic views of the inside of our Entropy Exhibition. Whilst I was on duty one day I took in my gear and took some photographs of the setup. I lugged in my insane Novoflex multi row pano head and took a number of frames for full 360˚ panoramas. I took images from a number of different locations in the room and have included a selection of some here for you to wander around the room as it were. You can also interactively manually pan (both left and right and up and down) and zoom the pano’s using the mouse or keyboard. With these 360˚ pano’s I’ve only used the middle row of images I took. I didn’t bother persisting with the multi row images (had some stitching problems so gave up :)). 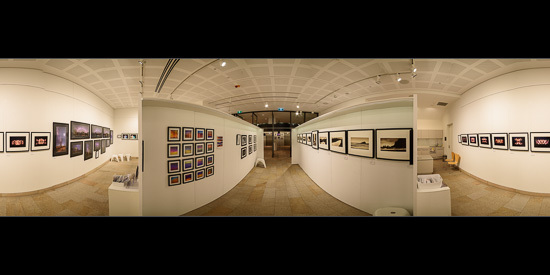 It’s a wrap and our Entropy Photography Exhibition is over. After many months of planning and preparing we can relax… well at least till our next exhibition :). 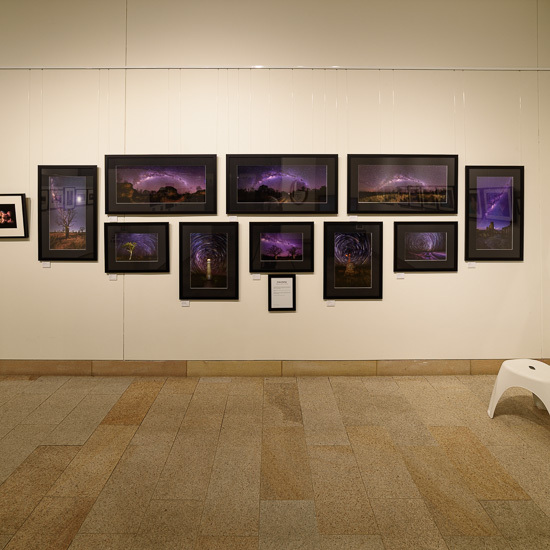 I thought you might like to take a look at what my small part of our exhibition space looked like along with some of the other work in the wider space. Above you get to see the tight layout of my ten chosen pieces. All fitting within my interpretation of the “Entropy” theme and encapsulated as the “Interstellar Series”. Exhibiting your work isn’t about getting rich financially. I figure going in that it costs more to put on than you expect back. It is however food for the soul and good for the creative artist in you. It’s an opportunity to refine your work and to work towards a specific goal. It’s a process of learning and growing. Even the experience of working out and doing everything you need to do to put on an exhibition (not just the images themselves) is both enlightening and rewarding. It also allows you to get your work out there for the wider public to see. There’s something truly rewarding spending time chatting with the people who come in to see your work. Having real conversations with them about the experience, the work and the results. Note: These photographs (especially the wider shots) look much better when larger. To see larger versions in an inline overlay slideshow gallery viewer click any of the images. 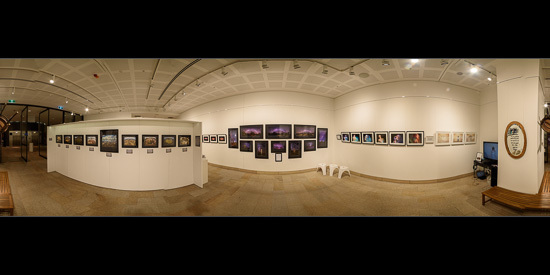 I’ve included a couple of the 360˚ pano’s here but only including the middle row of images. I didn’t bother persisting with the multi row images (had some stitching problems so gave up :)). I really must thank my fellow eight exhibitors and photographers, all part of “Parallaxis”. I’m grateful to you all for being so supportive and making all of this possible. Finally I must thank my family for putting up with me and allowing me the latitude to pursue this crazy passion of mine :). I’m already planning and working on my next body of work for a future exhibition some time. I think we’ll let the dust settle on this one before locking in the next :). We’d scoped out this little coloured cove the afternoon before. It was an ideal little spot for our first morning shoot on the island. 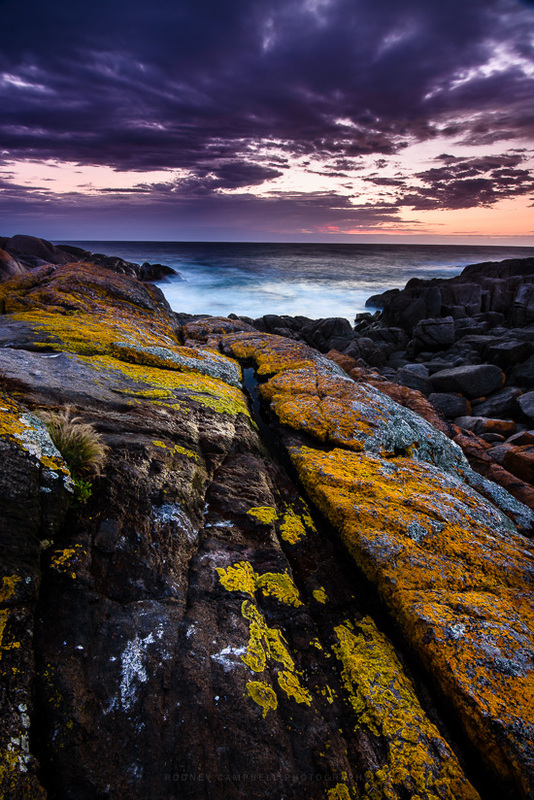 I mean you can see it was spectacular of course with all these multi coloured lichens on the rocks. It was also just a short 10-15 minute walk on a well maintained path from our accomodation as well. 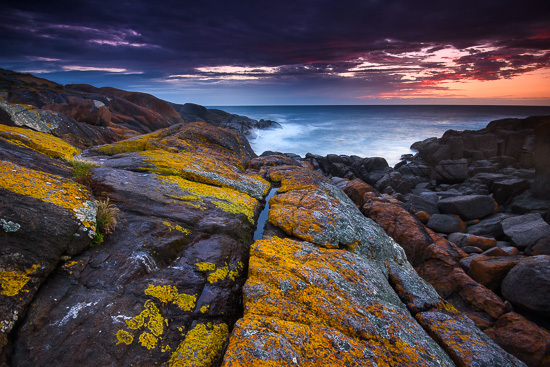 I had thought that these masses of bright orange and red lichen covered rocks would only be found on our more southern shores in Australia. Places like Tasmania (the Bay of Fires) and Kangaroo Island in South Australia. It was a totally unexpected but welcome surprise to find them here on the eastern coast of Montague Island. To start with we have a natural long exposure (a little over a minute) well before sunrise (5:15AM). Having a particularly colourful sunrise to go along with these beautiful rocks was an added bonus. If anything the array of colours was even more diverse here than in other places I’d seen these lichens. Here we had colours ranging from the deeper reds and oranges through yellow and lime green. 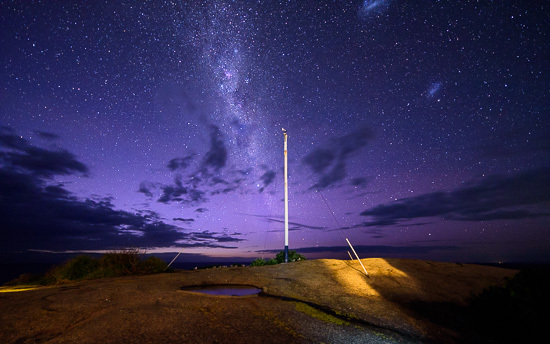 I was really hoping we’d get some nice clear nights, bright only with starlight, when staying on Montague Island. I’m a bit of an astro nut so any opportunity for dark skies away from city light pollution cannot be missed. The timing of our stay was right as far as the moon phasing was concerned. Unfortunately however the heavy clouds persisted at night. Star trails were definitely off the cards – a pity. We’d woken very early the first morning to shoot sunrise at a spot we’d recce’d the day before. I took a look outside and say some breaks in the clouds above so decide to head out quickly. It’s 4:15AM and I did manage a few shots during a break of a few minutes in the clouds. The first image above is literally taken five metres from my bed :). Looking south east we’ve got a hint of the early twilight glow on the horizon. I then headed up to the base of the lighthouse which sits up on a huge rock at the highest point of the island. 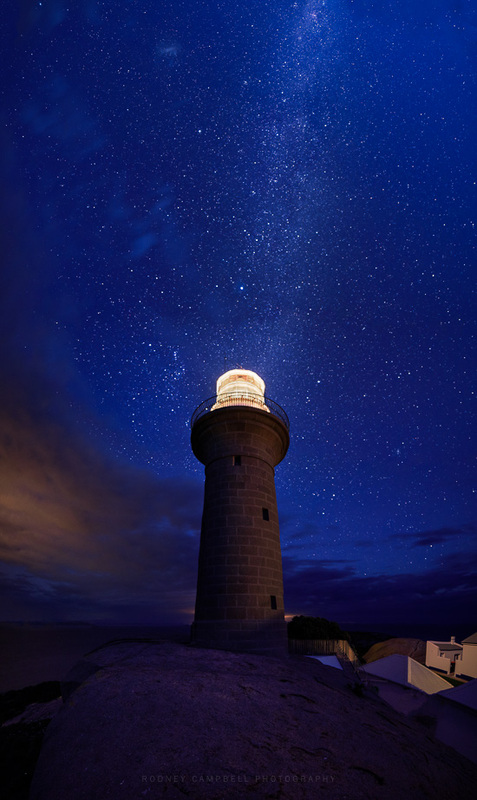 Looking north this time and framing to have the milky way shoot up from to top of the lighthouse. 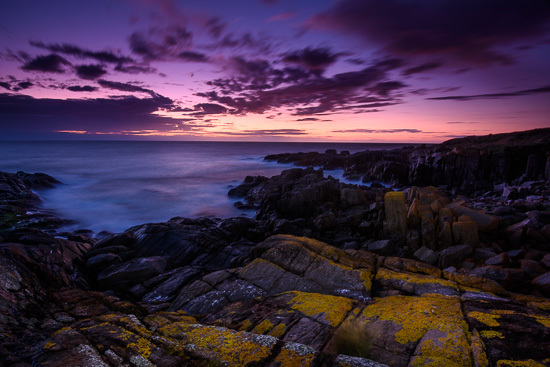 This is a stitched vertical panorama consisting of six (6) horizontal frames composed manually taken around 4:30AM. Then it was back to the cottages to meet everyone else rising for our planned sunrise shoot on the eastern coastline. Spectacular late afternoon (6PM) light out to sea on Montague Island. 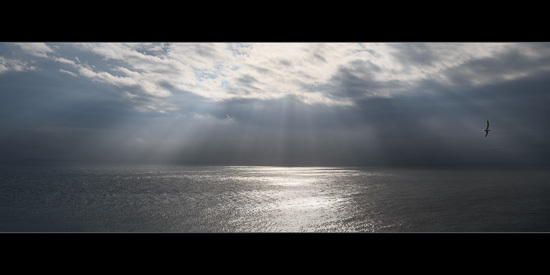 One could even say we had divine light, amazing back lit clouds and otherworldly god rays steaming out over the ocean. The scene was so beautiful but subtle I was wondering if I’d even be able to capture the essence of it with the camera. It was as if the hand of the divine reached down and spread their glory across the ocean. I took a few handheld images of the god rays but alas disappointment. Either I had a closeup detail of some of the rays or a very wide vista of mostly ocean and sky with a very tiny strip in the middle. Neither gave the grand scene justice. I decided to try one last thing – a wider stitched panorama with a longer focal length. This would let me convey the grand vista whilst also allowing you to see the detail in the rays. The image here is a stitch of ten (10) frames taken at 98mm handheld.